Take control of your cashflow. 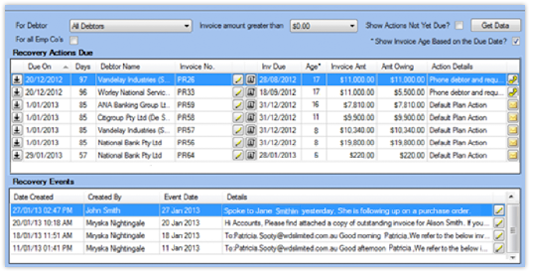 Our debtor management system provides a customisable invoice recovery plan unique to your business. This plan outlines step-by-step action, supported by detailed procedures, to ensure debtor management is being constantly and actively managed, delivering better results for less labour. Minimise associated risk and cashflow concerns associated with debtor management with Oncore. Invoice recovery plans are assigned to debtors, with automatic chasing of respective invoices followed by prompt email and phone correspondence. Oncore’s proprietary contractor management software provides the support you need to stay agile, flexible and in control in an increasingly fast-paced world. A fully white label solution, our software seamlessly integrates into your existing system, extending and enhancing your capabilities as an organisation and giving you more resources to fold into your core business. Spend less time administering your temporary workforce and more time realising the full value that they have to offer with Oncore’s ECM suite. Available on a range of pricing plans to suit businesses of every size and every budget, it’s a solution that can be customised to perfectly meet the challenges your organisation faces. Discuss your needs with the team at Oncore today and discover how we could help build the future of your business. Enquire about ECM today and let us show you what the next step for your organisation looks like.